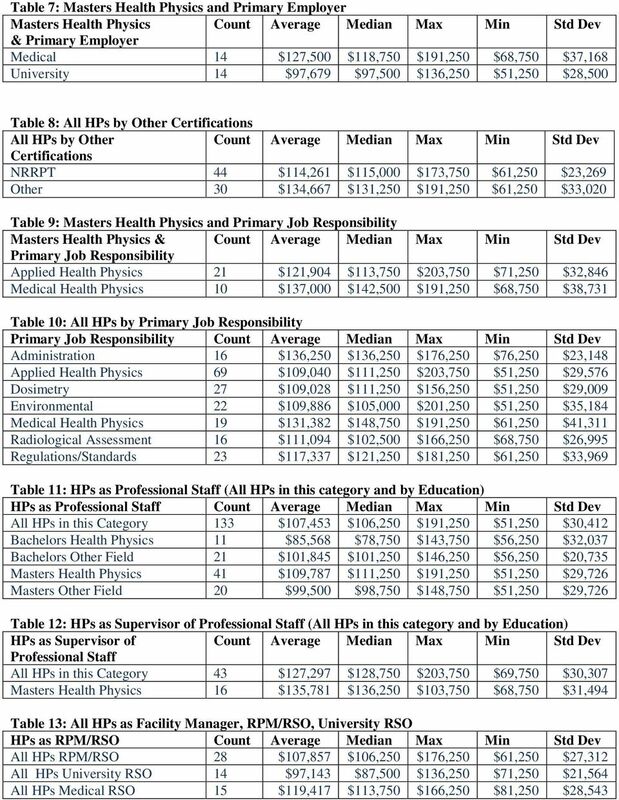 Download "THE 2013 HPS SALARY SURVEY"
1 THE 2013 HPS SALARY SURVEY Stephen L. Bump Introduction The 2013 Health Physics Society (HPS) survey data was collected by having health physicists (HPs) submit their responses to survey questions on a webbased data entry form. As was done in previous years, data was collected in conjunction with a salary survey of Certified Health Physicists (CHPs). The CHP salary survey results will be reported separately in the CHP News. The survey was also available in hardcopy form for those who preferred to fax or mail their responses. 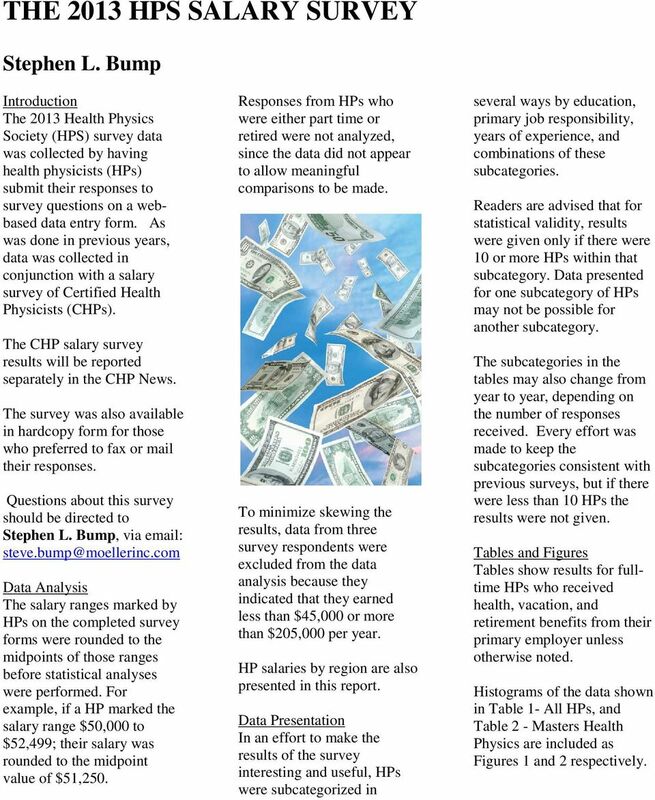 Questions about this survey should be directed to Stephen L. Bump, via Data Analysis The salary ranges marked by HPs on the completed survey forms were rounded to the midpoints of those ranges before statistical analyses were performed. 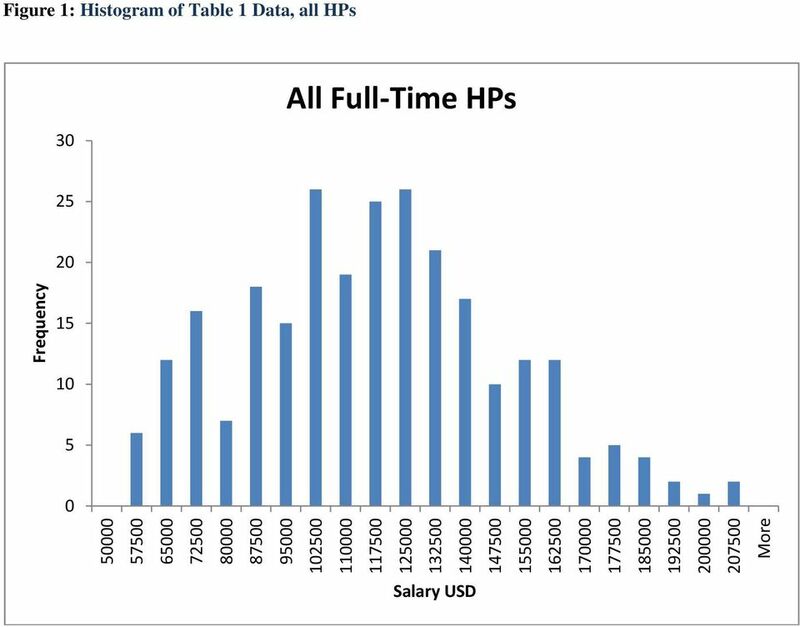 For example, if a HP marked the salary range $50,000 to $52,499; their salary was rounded to the midpoint value of $51,250. Responses from HPs who were either part time or retired were not analyzed, since the data did not appear to allow meaningful comparisons to be made. To minimize skewing the results, data from three survey respondents were excluded from the data analysis because they indicated that they earned less than $45,000 or more than $205,000 per year. HP salaries by region are also presented in this report. Data Presentation In an effort to make the results of the survey interesting and useful, HPs were subcategorized in several ways by education, primary job responsibility, years of experience, and combinations of these subcategories. Readers are advised that for statistical validity, results were given only if there were 10 or more HPs within that subcategory. Data presented for one subcategory of HPs may not be possible for another subcategory. The subcategories in the tables may also change from year to year, depending on the number of responses received. Every effort was made to keep the subcategories consistent with previous surveys, but if there were less than 10 HPs the results were not given. Tables and Figures Tables show results for fulltime HPs who received health, vacation, and retirement benefits from their primary employer unless otherwise noted. Histograms of the data shown in Table 1- All HPs, and Table 2 - Masters Health Physics are included as Figures 1 and 2 respectively. 2 All of the following tables are for fulltime HPs with health, vacation, and retirement benefits unless otherwise indicated. Table 1: All HPs All HPs Count Average Median Max Min Std Dev HPs 260 $113,702 $111,250 $203,750 $51,250 $32,382 Table 2: HPs by Education and Field Education Count Average Median Max Min Std Dev Bachelors Health Physics 17 $94,632 $81,250 $146,250 $56,250 $33,130 Bachelors Other Field 41 $101,311 $98,250 $173,250 $56,250 $25,072 Masters Health Physics 82 $119,817 $115,000 $203,750 $51,250 $33,252 Masters Other Field 43 $107,006 $98,750 $181,250 $61,250 $32,566 Masters Nuclear Engineering 15 $119,083 $121,250 $171,250 $61,250 $35,011 Ph.D. Health Physics 20 $126,375 $128,750 $201,250 $58,750 $35,868 Ph.D. Other Field 19 $131,118 $133,750 $156,250 $71,250 $22,615 Table 3: HPs by Education and < 6 Years Experience Edu & < 6Yrs Experience Count Average Median Max Min Std Dev All HPs < 6 yrs Experience 36 $79,444 $72,500 $156,250 $51,250 $23,312 Bachelors All Fields 12 $80,208 $77,500 $131,250 $56,250 $12,279 Masters Health Physics 10 $79,750 $72,500 $116,250 $51,250 $19,903 Table 4: HPs by Education and 6-15 Years Experience Edu & 6-15 Yrs Experience Count Average Median Max Min Std Dev All HPs 6-15 yrs Experience 36 $103,194 $100,000 $166,250 $51,250 $23,312 Masters Health Physics 12 $110,625 $103,750 $158,750 $86,250 $22,966 Table 5: HPs by Education and >15 Years Experience Edu & >15 Yrs Experience Count Average Median Max Min Std Dev All HPs >15 yrs Experience 185 $112,520 $121,250 $203,250 $56,250 $29,838 Bachelors Other Field 28 $105,089 $102,500 $173,750 $163,750 $25,788 Masters Health Physics 59 $129,343 $128,750 $203,750 $56,250 $30,841 Masters Other Field 29 $113,233 $111,250 $181,250 $61,250 $31,427 Ph.D. Other Field 14 $129,464 $135,00 $156,250 $71,250 $25,047 Table 6: HPs by U.S. Regions* HPs by Region Count Average Median Max Min Std Dev Northeast 51 $112,574 $111,250 $198,750 $51,250 $36,295 Midwest 42 $113,750 $111,250 $176,250 $61,250 $28,084 South 85 $114,574 $116,250 $201,250 $51,250 $32,706 West 51 $116,789 $118,750 $203,750 $58,750 $30,002 *- The four major regions of the United States as defined by the U.S. Census Bureau for which data are presented represent groups of states as follows: Northeast. Connecticut, Maine, Massachusetts, New Hampshire, New Jersey, New York, Pennsylvania, Rhode Island, Vermont. Midwest. Illinois, Indiana, Iowa, Kansas, Michigan, Minnesota, Missouri, Nebraska, North Dakota, Ohio, South Dakota, Wisconsin. South. Alabama, Arkansas, Delaware, District of Columbia, Florida, Georgia, Kentucky, Louisiana, Maryland, Mississippi, North Carolina, Oklahoma, South Carolina, Tennessee, Texas, Virginia, West Virginia. West. Alaska, Arizona, California, Colorado, Hawaii, Idaho, Montana, Nevada, New Mexico, Oregon, Utah, Washington, Wyoming. 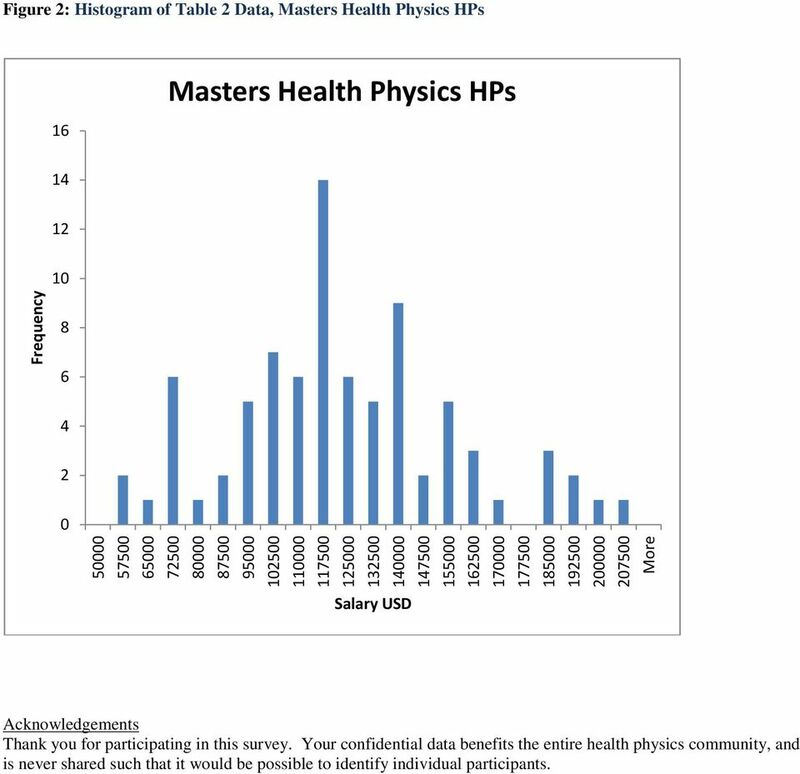 5 Figure 2: Histogram of Table 2 Data, Masters Health Physics HPs 16 Masters Health Physics HPs Frequency More Salary USD Acknowledgements Thank you for participating in this survey. Your confidential data benefits the entire health physics community, and is never shared such that it would be possible to identify individual participants.